Mesenchyme is a type of tissue characterized by loosely associated cells that lack polarity and are surrounded by a large extracellular matrix. Mesenchymal cells are able to develop into the tissues of the lymphatic and circulatory systems, as well as connective tissues throughout the body, such as bone and cartilage. A sarcoma is a malignant cancer of mesenchymal cells. Mesenchyme is characterized morphologically by a prominent ground substance matrix containing a loose aggregate of reticular fibrils and unspecialized cells. Mesenchymal cells can migrate easily, in contrast to epithelial cells, which lack mobility and are organized into closely adherent sheets, and are polarized in an apical-basal orientation. Mesenchymal tissue is a tissue type composed of migratory cells that have undergone an epithelial to mesenchymal transition. Mesenchyme exists as essential migratory tissue in embryonic development, plays several roles in the adult, and can form as a result of cancer cells metastasizing. It lacks a specifically defined morphological structure, but is characterized by a lack of cell surface adherent molecules such as E-cadherin, non-polarity, extending filopodia, and high migratory capacity. The cells are surrounded by large extracellular matrix. Some mesenchyme will also undergo a mesenchyme to epithelial transition, which is the basis for migratory metastasizing cancers such as metastatic squamous cell carcinoma. The first emergence of mesenchymal tissue occurs during gastrulation from the epithelial to mesenchymal transition (EMT). This transition occurs through the loss of E-cadherin, tight junctions, and adherens junctions on the cell membranes of epithelial cells. The surface molecules are endocytosed and the microtubule cytoskeleton loses shape, enabling mesenchyme to migrate along ECM. EMT occurs in embryonic cells that require migration through or over tissue, and can be followed with a mesenchymal to epithelial transition (MET) to produce secondary epithelial tissues. 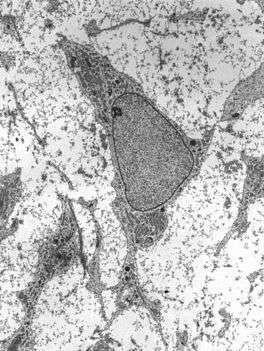 Embryological mesenchymal cells expresses fibroblast-specific protein (Fsp1), which is indicative of their shared properties with the migratory adult fibroblasts, and c-Fos, an oncogene associated with E-cadherin down-regulation. Both formation of the primitive streak and mesenchymal tissue is dependent on the Wnt/β-catenin pathway. Specific markers of mesenchymal tissue include the additional expression of ECM factors such as fibronectin and vitronectin. The first cells of the embryo to undergo EMT and form mesenchyme are the extra-embryonic cells of the trophectoderm. These migrate from the body of the blastocyst into the endometrial layer of the uterus in order to contribute to the formation of the anchored placenta. The formation of primary mesenchyme depends on the expression of Wnt3. Other deficiencies in the Wnt signaling pathway, such as in Nodal (a TGF-beta protein), will lead to defective mesoderm formation. The tissue layers formed from the primitive streak invaginate together into the embryo and the induced mesenchymal stem cells will ingress and form the mesoderm. Mesodermal tissue will continue to differentiate and/or migrate throughout the embryo to ultimately form most connective tissue layers of the body. The interaction with ectoderm and somite-forming morphogenic factors cause some primary mesenchyme to form neural mesenchyme, or paraxial mesoderm, and contribute to somite formation. Neural mesenchyme soon undergoes a mesenchyme to epithelial transition under the influence of Wnt6 produced by ectoderm to form somites. These structures will undergo a secondary EMT as the somite tissue migrates later in development to form structural connective tissue such as cartilage and skeletal muscle. Neural crest cells (NCCs) form from neuroectoderm, instead of the primary mesenchyme, from morphogenic signals of the neural crest. The EMT occurs as a result of Wnt signaling, the influence of Sox genes and the loss of E-cadherin from the cell surface. NCCs additionally require the repression of N-cadherin, and neural cell adhesion molecule (NCAM). NCCs ingress into the embryo from the epithelial neuroectodermal layer and migrate throughout the body in order form multiple peripheral nervous system (PNS) cells and melanocytes. Migration of NCCs is primarily induced by BMP signaling and its inhibitor, Noggin. In some invertebrates - Porifera, Cnidaria, Ctenophora and some triploblasts (the acoelomates) - mesenchyme refers to a more-or-less solid but looselly organized tissue consisting of a gel matrix (the mesoglea) with various cellular and fibrous inclusions, located between epidermis and gastrodermis. In some cases, the mesoglea is noncellular. It is derived wholly or in part from ectoderm (not considered true mesoderm). In sponges, it is called mesohyl. In Cnidaria and Ctenophora, it is fully ectodermally derived. When cellular material is sparse or densely packed, the mesenchyme may be sometimes called collenchyme or parenchyme, respectively. When no cellular material is present (e.g., in Hydrozoa), the layer is properly called mesoglea. In some colonial cnidarians, the mesenchyme is perforated by gastrovascular channels continuous among colony members. This entire matrix of common basal material is called coenenchyme. In order to differentiate the use of the word mesenchyme in vertebrate embryology (that is, undifferentiated tissue found in embryonic true [ento-]mesoderm from which are derived all connective tissues, blood vessels, blood cells, the lymphatic system, and the heart) and the use in invertebrate zoology described above, some authors prefer to use the term mesoglea (in wider sense) in lieu of mesenchyme when referring to the middle layers of sponges and diploblasts, reserving the term mesenchyme for the embryological sense. However, Brusca & Brusca (2003) discourage this usage, using mesoglea in its strict sense, and preferring to maintain both the embryological and zoological senses for the term mesenchyme. Finally, some similar terms used in botany generally are differentiated by the suffix "a": mesenchyma (a tissue between xylem and phloem in roots), collenchyma (primordial leaf tissues) and parenchyma (supportive tissues). ↑ Strum, Judy M.; Gartner, Leslie P.; Hiatt, James L. (2007). Cell biology and histology. Hagerstown, MD: Lippincott Williams & Wilkins. p. 83. ISBN 0-7817-8577-4. ↑ Sadler, T.W. (2006). Langman's Medical Embryology. Lippincott Williams & Wilkins. pp. 68–70. ISBN 0-7817-9485-4. 1 2 Nombela-Arrieta, C., Ritz, J., Silberstein, L. (2011) The elusive nature and function of mesenchymal stem cells. Nat Rev Mol Cell Biol 12(2): 126-131. 1 2 Cano A, Perez-Morena MA, Rodrigo I, Locascio A, Blanco MJ, del Bario MG, Portillo F, Nieto MA. (2000) The transcription factor snail controls epithelial-mesenchymal transitions by repressing E-cadherin expression. Nat Cell Biol 2: 76-83. ↑ Vallenius, T. (2013) Actin stress fibre subtypes in mesenchymal-migrating cells. Open Biol 3(6): 130001. 1 2 Kalluri RK, Weinburg, RA. (2009) The basics of epithelial-mesenchymal transition. J Clin Invest 119(6): 1420-1428. ↑ Okada H, Danoff TM, Kalluri R, Neilson EG. (1997) Early role of Fsp1 in epithelial-mesenchymal transformation. Am J Physiol 273: F563-574. ↑ Eger A, Stockinger A, Schaffhauser B, Beug H, Foisner R. (2000) Epithelial mesenchymal transition by c-Fos estrogen receptor activation involves nuclear translocation of beta-catenin and upregulation of beta-catenin/lymphoid enhancer binding factor-1 transcriptional activity. J Cell Biol 148(1): 173-188. ↑ Mohamed OA, Clarke HJ, Dufort D. (2004). β-catenin signaling marks the prospective site of primitive streak formation in the mouse embryo. Dev Dyn 231: 416-424. ↑ Theiry JP, Sleeman JP. (2006) Complex networks orchestrate epithelial-mesenchymal transitions. Nature Reviews Molecular Cell Biology 7:131-142. ↑ Yamakoshi, S., Bai, R., Chaen, T., Ideta, A., Aoyagi, Y., Sakurai, T., Konna, T., Imakawa, K. (2012) Expression of mesenchymal-related genes by the bovine trophectoderm following conceptus attachment to the endometrial epithelium. Reproduction 143(3): 377-387. ↑ Bellairs R. (1986) The primitive streak. Anat Embryol 174: 1-14. ↑ Hay ED. (2005) The mesenchymal cell, its role in the embryo, and the remarkable signalling mechanisms that create it. Developmental Dynamics 233(3): 706-720. ↑ Mareschi, K., Novara, M., Rustichellia, D., Ferrero, I., Guido, D., Carbone, E., Medico, E., Madon, E., Vercelli, A., Fagioli, F. (2006) Neural differentiation of human mesenchymal stem cells: Evidence for expression of neural markers and eag K+ channel types. Exp Hematol 34(11):1563-1572. ↑ Schmidt C, Stoeckelhuber M, McKinnell I, Putz R, Christ B, Patel K. (2004) Wnt 6 regulates the epithelisation process of the segmental plate mesoderm leading to somite formation. Dev Biol 271(1): 198-209. ↑ Stockdale FE, Nikovits W, Christ B. (2000) Molecular and cellular biology of avian somite development. Dev Dyn 219: 304-321. ↑ Bronner-Fraser, M. (1994) Neural crest cell formation and migration in the developing embryo. FASEB J 8(10): 699-706. ↑ Trainor, P. (2005) Specification of neural crest cell formation and migration in mouse embryos. Semin Cell Dev Biol 16(6): 683-693. ↑ Brusca, R.C. & Brusca, G.J. (2003). Invertebrates. 2nd ed. Sunderland, Massachusetts: Sinauer Associates, p. 101. 1 2 3 4 5 6 7 Brusca & Brusca (2003), p. 220.